A little while ago Orbital ATK’s Cygnus spacecraft blasted off atop an Atlas V rocket from Cape Canaveral. After about 21 minutes it successfully separated from the rocket’s last stage went en route to its destination. This is its seventh official mission, called Orbital-7 or simply Orb-7 but also CRS OA-7, to transport supplies to the International Space Station for NASA. This Cygnus spacecraft was named “John Glenn” after the American astronaut and senator who passed away in December 2016. 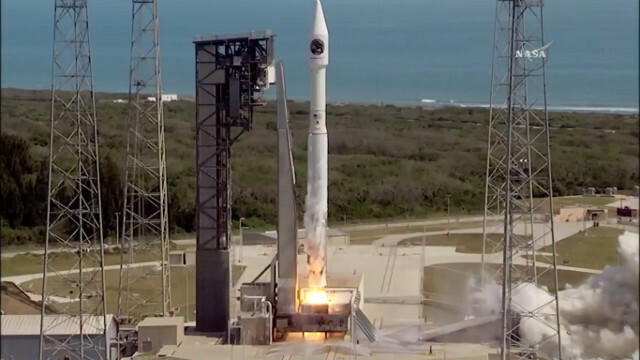 By now the advanced version of the Cygnus that entered service in December 2015 has been tested a number of times so its greater payload capacity and its more advanced systems can be exploited at their best. In the previous mission of the Cygnus cargo spacecraft, Orbital ATK had successfully used the new version of its Antares rocket. However, NASA needed to send a large cargo to the International Space Station, excessive for that rocket’s possibility. For this reason, once again it was necessary to resort to ULA’s services and set up a launch with the powerful and versatile Atlas V rocket. The Cygnus spacecraft carries a total of almost 3,5 tons (more than 7,600 lbs) of cargo that include 954 kg (2,103 lbs) of various types of supplies for the crew, 1,215 kg (2,678 lbs) of hardware and the rest in equipment and various components. 38 CubeSat class nanosatellites and a number of experiments needed for the scientific research conducted on the International Space station are included. Among the experiments carried on the Cygnus there are various ones regarding biological and medical research including the Advanced Plant Habitat, one of the several concering studies on the growth of plants in microgravity. On the International Space Station various plants were grown in recent years and each new experiment will help better understand how to create working space greenhouses. The Cygnus spacecraft is scheduled to reach the International Space Station on Saturday to be captured by the robotic arm Canadarm2. Generally the journey of space cargo ships is faster but next Saturday the launch of new Station crew members is scheduled and they have a priority. If there are no problems, the day after the Cygnus arrival the crew will open the hatch and can begin its unloading.